Warm welcome to Dieter Müller, Germany! I appreciate a lot the support and activity of Peter Harris! After some pause, it’s nice to see again two active authors at the site – S. K. Balasubramanian and Pierre Tritten! 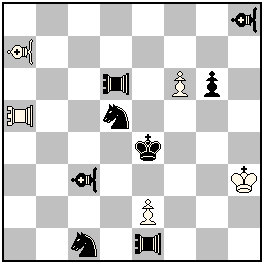 White Maximummer – Only White must play the geometrically longst moves, Black plays orthodoxal. Lortap –A piece cannot capture or check if it is observed by a piece of its own side. Ultra-Patrol Chess – A piece can move, capture or give check only if it is observed by a piece of its own side. ENG: Reciprocal interchange of functions of both white Grasshoppers (sacrifice – piece/mating piece) – a passive Zilahi. Reciprocal change of squares a1/a2 and a7/f6. Model mates after black self-blocks. • Exchange of roles between three pairs of LR/LB (LRa5/LBa7, LRd6/LBc3, LRe1/LBh8). • Dynamic battery play by white. • Grimshaw on c5 by white LR/LB. • Anticipatory line opening by BS. А nice idea, of course, but in my opinion, here are possible some better versions. 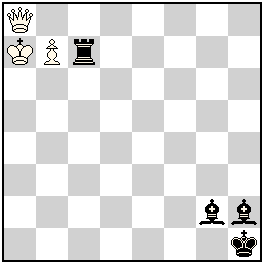 I will cite only one position, which has the following advantages in comparison with the original: a) removed are the technical white pieces bishop and knight; b) the black pawns demonstrate here also theme Excelsior: White: Kc1, Ge1, Gf1; pawns: a3,b2, b5 (6); Black: Ka1, pawns: b3,c2, e4, f7,g7 (6) – Ser – h#7 b) Ka1 – a2; solutions: a)1.f7-f5 2.f5-f4 3.f4-f3 4.f3-f2 5.f2xe1=G 6.Ge1-e5 7.Ge5-a1 Gf1-a6‡; b) 1.f7-f5 2.f5-f4 3.f4-f3 4.f3-f2 5.f2xe1=G 6.Ge1-e5 7.Ge5-a1 Gf1-a6‡. Here the total number of Figure is already 12, but the problem remains Meredith. Now each twin has 2 solutions. New solutions justify the presence of LBh8/LRe1 by showing exactly the moves 1.LRxe2-e3/1.LBxf6-e5 which are prevented in the thematic solutions. Thanks for your detailed analysis. I always welcome such comments as it gives me opportunity to know my strength as well as weaknesses and I have learnt a lot and improved my quality of composing through such useful advice and comments. However, I had only an initial glimpse of your comments and did not see it thoroughly. I will send my reply later. This is a thorough and original analysis, which I keep almost fully! Not for the first time Nikola manifests fantasy and true aesthetic sense – his ideas deserve always attention! For me it is interesting to know: how the authors (two world known composers) would respond to the current Predrag`s comments? Probably on this occasion exists a good opportunity for fruitful discussion? Of course, I will share also some ideas on this subject, but later. Yes you are absolutely right. LBh8 & LRe1 are not at all needed. It was unfortunate that we tried with an initial idea to show that 3.LBh8xf6 & 3.LRxe2 were not possible after the mate and our entire problem was centred around this idea only. The cooks by shifting BSc1-h7 and removing BPg6 are interesting. We knew about these cooks earlier. In fact in the original problem we added BSc1 & BPg6 only to avoid these cooks. Your suggestion of adding tries to the problem justifies the presence of LBh8 & LRe1. In the 2nd version suggested by you, if we replace LBh8 & LRe1 by Locusts then their presence may be justified. However, in the above LRe1 is sufficient instead of Le1 to justify its presence. Now the problem looks ugly with Lh8 & LRe1. We think your suggestion of adding tries is a better remedy to the problem. However, we will try to see whether there is any further improvement possible, as the best possible would be to justify the presence of LBh8 and LRd1 by the solution and not by the tries. it’s incredible how such a small detail could change things. Now the cooks became solutions. The new pair of solutions has some esthetic imperfections but the content is so rich and white economy so good that I am delighted with your problem. 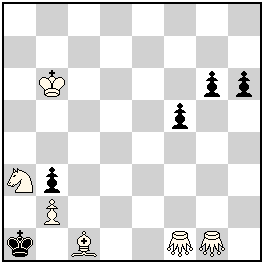 All white pieces (except wK) participate in all phases (white Pawns are justified as well). In the old pair of solutions the rear piece of a “Grimshaw-formed” battery checks and the front piece prevents the move which is legally played in the other phase. 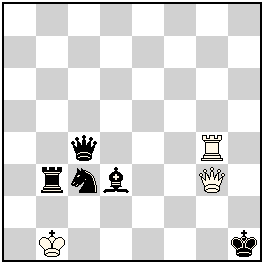 The mating white piece is on the edge of the board, so it is not attacked by black Royal piece in the end. In the new pair of solutions wLR mates twice but now it is attacked in the end by black Royal piece and wLB guards it indirectly by attacking the landing square of the black Royal piece in case of capture. My delight certainly should not prevent you to search for improvements. Thanks, I have enjoyed indeed! Oh, I forgot to mention that the moves of brS to 4 different squares add a considerable weight to the content. Thanks for your encouraging reply and comments. I understand from your last comment that you agree for using Lh8 & Le1 instead of LBh8 & LRe1. Am I right? If so, can you kindly suggest whether we should use Le1 or LRe1 as both will give sound solution? We will be extremely thankful to hear the opinion of others and especially the expert opinion of Mr. Petko in this regard. my knowledge and experience are certainly not enough to give any lectures, particularly about the fairies. But as long as there is a possibility for logical resoning, I can analize and present my conclusions/assumptions which then could be discussed by the others. It’s not important whether individually I’m right or wrong, the goal is that we all eventually come closer to the truth. The aestethics relies on personal standards. Theoretically, noone could be entitled to proclaim some definite general aesthetic standars. But in practice, we should be glad to hear the opinion and advice given by a person of great knowledge and experience. Aesthetic standards are a delicate balance of the innumerable relations between the features of innumerable examples that someone has experienced. This balance is still individual, but the multitude of the experienced elements gives the potential for the delicacy. I have tried to describe what logical balance I see between the phases and various elements in your problem. I found it rich and splendid and this wouldn’t change with the choice of the piece on e1. My level of delicacy must leave such a detail to a personal taste. A greater knowledge and experience might percieve “my” details as much bigger. But I don’t think that the main attention would be given to the piece on e1. I have seen in earlier problems your detailed analysis. I am not a very experienced composer, but sometimes get some funny ideas which sometimes leads to a good problems sometimes a very ordinary problem. However, I always wish to hear the opinion of every one and I mostly show my problems to more experienced persons before publishing. I really thank you for your extremely good analysis of our problem No.57 and I will wait further for the opinion of others and then consult Pierre for modifying the problem. I’d like to share my opinion, emphasize on some new and very important moments in this work. It is obviously, that a LR/LB Grimshaw can be realized only after double captures of enemy figures – in this case, on the fields b6 and b5. This combination also reminds somewhat of Novotny, but because here the captures of figures are made on different fields, more accurately is probably to speak about Grimshaw. But this terminological question is not so important. In theoretical and practical aspect more important is another thin: in our strange LR/LB Grimshaw two other captures are needed – on the second white moves. In № 57 these captures are: 2…LBxd6-e7 (brS=rLR) # and 2…LRxc3-c2 (brS=rLB) #. 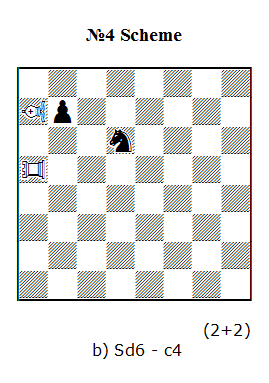 Here the piece LRd6 is very important in solution a) because it determines the phase of the black King. But it is obviously, that in this phase LBc3 is completely unnecessary and useless piece. On the contrary – in solution b) LRd6 is completely unnecessary and useless piece. Whether this fact is a fault of the problem? This is the first, a very important question here! The answer is not easy. Nowadays, in orthodox Helpmates we see many works in which some black figures play only in one phase but they are not needed in other solutions. For example, this well-known compromise is almost a traditional phenomenon in most H# – tasks. The judges assessed differently this defect. Many arbiters perceive it as a necessary evil. But other judges reduce the evaluation in such cases. There are no official rules in this regard and every judge proceeds according to his views. But according to my subjective opinion, in № 57 the situation is worse – Here the LRd6 and LBc3 are not only “half – redundand” and also quite immobile in the solutions, in which they have no role. This fact creates an oppressive mood. Because here the play-distance is short (only 4 half-moves) there is no time to use simultaneously both figures LRd6 and LBc3. 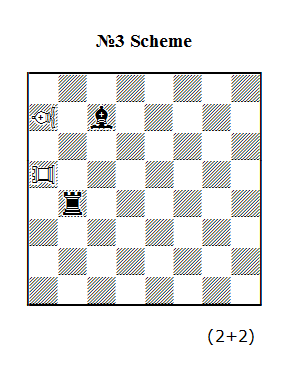 This scheme means that in a) position a superfluous figure will be LBc3, and in position b) – LRd6. Here is impossible practically to load these pieces with some additional technical features (for example – removal of cooks) . My recommendation is: do not start work with such positions! But in this very initial phase of work if you have already created position № 1, the question is: whether here exists a better starting position with analogical thematic? a) You try to modify your initial scheme (№ 1) with goal to remove its defect – in a very early stage of the work! b) This modification means creation of many similar mechanisms, where there are no superfluous pieces in the different phases. In scheme №2 – Here you plan: I. 1. Sb6! LBxb6-c5 and then 2.LBxd6-e7; II. 1. Sb5! LRxb5-c5 and then 2.LRxc4-c3. There is no superfluous black figures here! 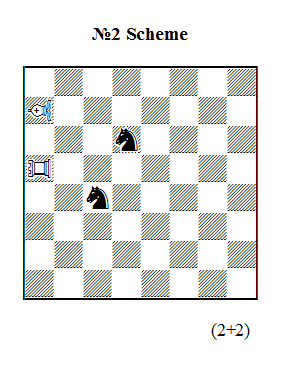 On the contrary – the two black Knights play wonderful fulfilling the idea ofinterchange of functions. If you need the different kinds of pieces on d6/c4 , you can use other combinations of pieces that have in theirs movements elements of a S – trajectory – MAO, MOA, Rose, Nightrieder, NAO, Nighthopper, etc. Analogical situation shows scheme №3 – I. 1.Bb6! LBxb6-c5 and 2.LBxb4-a3; II. 1.Rb5! LRxb5-c5 and 2.LRxc7-c8 etc… Also a very nice interchange of functions between two duos of pieces! An other type of work-schemes here is demonstrated in №4 – а) 1. b6! LBxb6-c5 and 2. LBxd6-e7; b) 1. b5! LRxb5-c5 and 2.LRxc4 – c3. I recommend you to create a big number of primary schemes of the type №2 – №4. After that, you can choose one of them and you can continue the work, adding to the initial scheme new thematic elements. In the other words, you start with an excellent initial scheme with goal to create a large number of new, more complex working patterns! Every simple starting scheme of type №2- №4 you can develop to more complex structures observing the following rule: Work without any compromise, if it is possible! 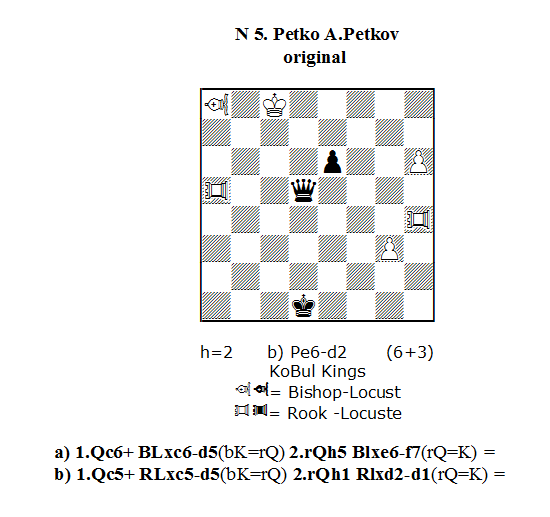 Returning to the task № 57, I can say: it is a very interesting and ambitious achieve, but here the first problem is to comment and to permit question about the doubtfull black pieces: LRd6 and LBc3. Before to this action is unacceptable to comment the status of two other doubtfull pieces on the board – LBh8 and LRe1. However, my opinion is that LBh8 and LRe1 are bad figures – they are even worse than the static LRd6 and LBc3. The creation of tries with superfluous pieces is not desirable in fairy composition, although such trend exist long time in the orthodoxal twomover, for example. Therefore, the authors of №57 can amend and improve significantly this problem paying more attention to the black material on the board. If we speak for the exellent new Diyan’s condition KoBul Kings, I can recommend – use more often captures of the black pawns, toreturn to the black king its otrodoxal phase! Another recommendation: try your realization in h=2! Umnov theme with specifical model stalemate-finals. But is it also a White Grinshaw with creation of reciprocal LR/LB and LB/LR batteries? A surprising question which have not easy answer!! In the first solution LB closed line by LR but de facto after the 2nd – stalemate-move, LR controls not square h5, but square g5!! 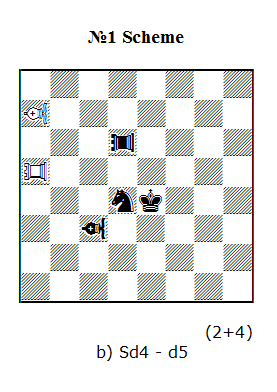 Analogical, in b) after the 2nd – stalemate-move, LB controls not square h1 but square g2!! In my opinion, after white moves LRxc5-d5 and LBxc6-d5 we have a “Special White Grimshaw” with creation of indirect white batteries!! Why indirect? 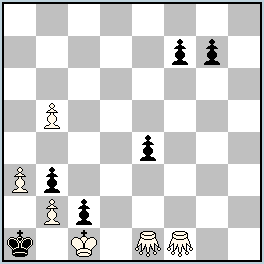 The answer: because after the stalemate moves LRa5 and LBa8 keeps suares around the white King – g5 and g2!! The LB/LR Grimshaw is a very difficult theme – especially in short problems (H#2). Therefore, here I recomm to look for an extension of the play game at least to 2.5 moves, or even 3 moves. Theoretical , a H#3 has 6 half-moves and here is possible (in one or other degree) to activate all pieces on the board from the Locust family. This aesthetical goal is very important for all kind and colors of Locust figures! The LB/LR Grimshaw gives good chances in HS# genre but also in longer distance – 2,5, or more moves. An other recommentation is to use neutral (or half-neutral) LB and LR which promissing more dynamic play. It is amazing to see such a great detailed analysis. It is a sort of lesson not only to us but also to all budding composers like me. Your advice will not only help me in improving the present problem but also will help me in future compositions. I will consult Mr. Pierre and will try to improve as per your suggestions. Many many thanks for sparing your valuable time to comment on our problem with so much of details. Thank you, Petko for these invaluable advices that will try to use in our further compositions. 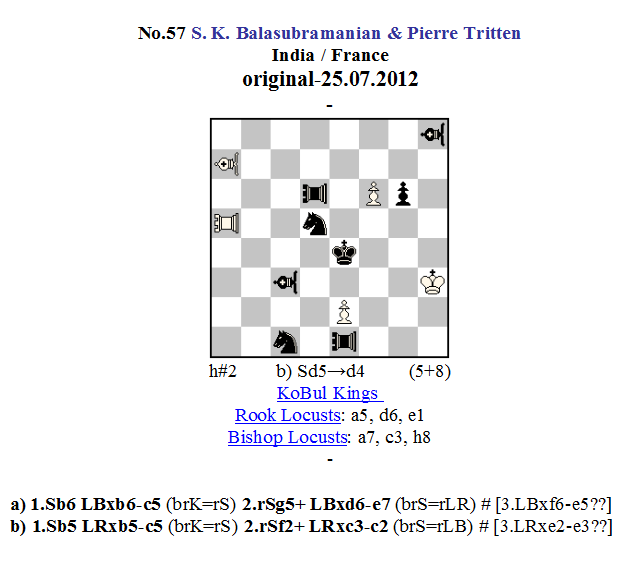 In your n°5, the use of static LR/LB to keep squares around BK is impressive! N0.57 “Don’t start building a house on the weak foundation, for the troubles will multiply as the building progresses” – important and wise advice, not only for the chess composition, but here it’s clearly illustrated by chess positions. Didactical examples show how to make a firm foundation for any scheme in the very beginning. In an ideal case, the choice of the thematic pieces and the squares on which they will stand, should allow the maximum of functionality and activity of those pieces in all phases. Elements are unified into one economical mechanism when they fully interchange their functions through the various phases. But there are two kinds of mechanisms. The properties of the pieces combined with the geometrical properties of the board, make a kind of “mechanical“ mechanism. We can see how it works apparently during the play through the phases, without understanding the real motivations and the effects which are relevant for the play. The logic motivations and effects which are relevant, as beeing necessary for a solution, are the elements which make an “abstract“ or “logical“ kind of mechanism. It’s not always easy to perceive it, but the logical mechanism reveal a true “real“ beauty (despite being “abstract“). Any attempt for a high quality should present a good, convincing balance between the “logical“ and the “mechanical“ mechanism. Personally, I deeply adore and remember the logical mechanisms which show why the solutions must be just as they are (and also why the accompanying mechanical mechanisms were constructed).